There are over 36 million people over the age of 65 in the United States. According to statistics, many will need some form of assisted living, such as a nursing home, assisted living facility or other elderly facility. Unfortunately, between one and two million Americans age 65 or older are abused in some way each year. This abuse can take the form of neglect, when a nursing facility fails to meet the basic needs of a patient, or physical abuse, when a nursing staff member injures a patient. If you or a loved one have suffered due to a nursing home abuse, you have the right to file a claim. 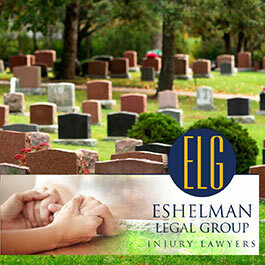 Contact the Eshelman Legal Group by clicking here for a FREE consultation. It’s important to remember that no matter how old you are, you have rights. 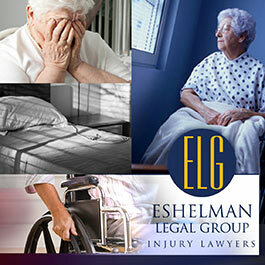 If your mother, father or other elderly loved one has experienced unsatisfactory care or injuries that you feel may constitute abuse, we encourage you to call the Eshelman Legal Group. We are committed to upholding the quality of care in our long-term care institutions by taking swift legal action to compensate nursing home residents and their families for injuries resulting from neglect or inadequate care.